Music: An aesthetically pleasing or harmonious sound or combination of sounds. Kermit Lamont Stringfellow is a Los Angeles native, an only child, and a third-generation musician. He was born into a home that was always filled with the sound of music. His mother had an extensive music collection which exposed Kermit to many different genres of music during his formative years. Kermit’s dad is a guitarist who has traveled abroad for many years with his own band. This introduction to music allowed Kermit to grow up as a “band baby.” Kermit attended most of his father’s rehearsals. From the rehearsal/studio sessions Kermit clung to the drums at age of three. From this time, Kermit knew what he wanted to do for the rest of his life-he wanted to write music, play drums, and perform. Unlike most, he was certain of his destiny early in his life. When asked about his philosophy on music Kermit states, “I have a simple philosophy on music, make it feel good! I know if I can count it, I can play it”. In grade school Kermit picked up the trumpet, but he knew his true passion was to be a great drummer. As he progressed in his education he held down the first snare throughout his high school tenure. One of his high school highlights was his set drum performance at the Los Angeles Sports Arena for the high school basketball team as they clinched the city championship two consecutive years. During those years he spent a great deal of time honing his craft and learning the industry from his father. He played for numerous local churches and outdoor festivals. “Playing with my dad was a real big deal at the time”, says Kermit, “He’s harder on me than anybody”. From this experience Kermit concentrated on becoming the R&B Funk Master. This was based on his passion for R & B music. 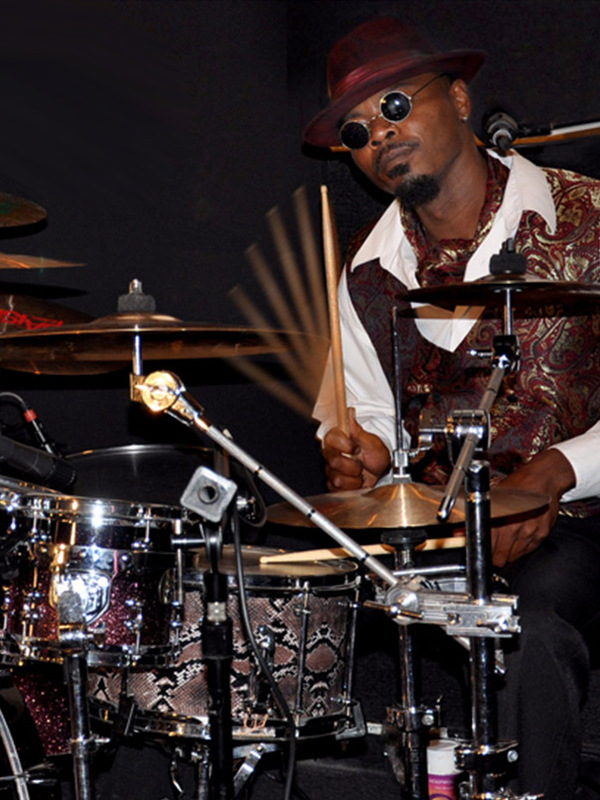 Studying drum legends like Buddy Miles, David Garibaldi, and James Brown’s drummers, Kermit learned and perfected the art of the “pocket” and carved out his own sound which consists of funky grooves, entangled with a heavy foot and a hypnotic back beat. Straight out of high school he started playing the L.A. blues scene, traveling and performing with local groups throughout Southern California. Shortly thereafter Kermit needed a change and wanted to enlighten a larger audience with his talent, so he moved to Las Vegas. In moving to Las Vegas he played behind review groups such as The Temptations, The Drifters, The Platters, and occasionally subbed for Marvin Gaye’s former drummer, Bugzy Wilcox. For six years he played the Vegas scene. This change afforded him a great deal of experience with seasoned vocalists and musicians. The experience also gave him an enormous education in show business. This was largely due in part to the myriad jobs doing session work and jam sessions he secured during his tenure in Vegas.